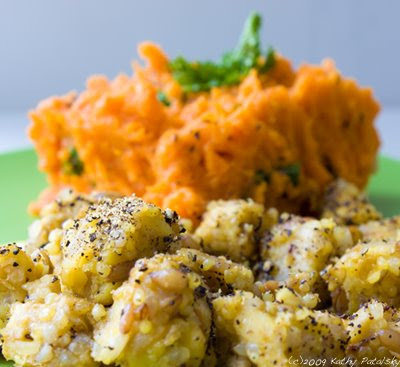 Sweet Potatoes and Tempeh: A Mash Made in Heaven. 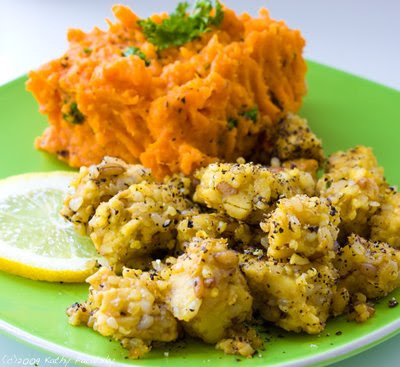 One of my favorite food pairings is a hot plate of Lemon Pepper Tempeh and Mashed Sweet Potatoes. It's a mash made in vegan heaven! Soon to be right up there with veggie burgers and fries, peas and carrots, beans and rice and salsa and chips. Mark my words! Sweet Potatoes. I love sweet potatoes with just about anything. 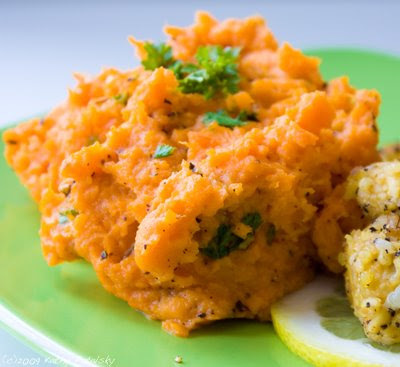 I've pretty much mastered my Kathy's Famous Sweet Potato Mash. And now I've found the perfect food pairing for it: Lemon Pepper Tempeh. And quite frankly, I eat this combo least 3-4 times a week! I love it. Lemon Pepper Tempeh. One of my favorite ways to prepare tempeh is to lemon pepper it. I've got an easy recipe that you can prepare in just a few minutes. It's zesty, nutty and satisfying. 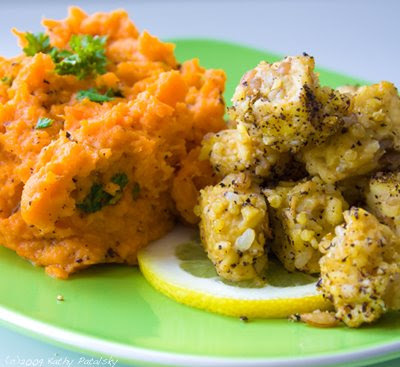 You can use the super easy recipes below, or reference my Lightlife Lemon Peppered Tempeh and Kathy's Famous Sweet Potato Mash recipes. *in this dish (photos shown) I used SoyBoy Multigrain tempeh. Add lemon juice and veggie broth to pan. When pan is sizzling, add in tempeh. Saute for a few minutes, uncovered. Add agave and a few dashes of fine black pepper. Saute for a few more minutes, brown all sides. *tip: cover for a few minutes and toss in steam. 'Fluffs up' the tempeh for a moist bite. When tempeh looks done, turn off heat. Add salt and a lot more pepper. Plate tempeh and grind a bit of fresh black pepper on top. 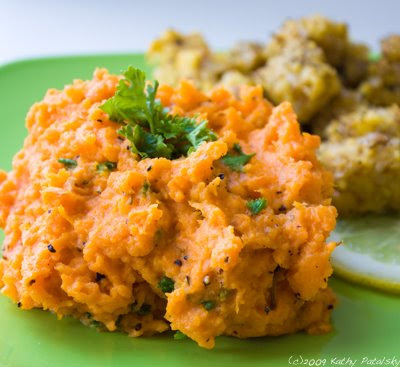 See Kathy's Famous Sweet Potato Mash here. 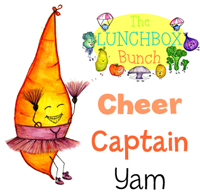 1 medium organic garnet yam. 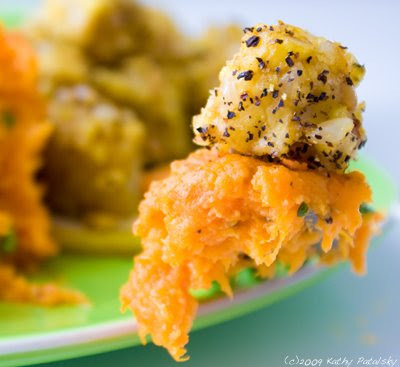 Cook sweet potato in microwave or oven. Mash all ingredients together by hand using fork. For thinner potatoes add a bit of olive oil and/or veggie broth. ...and enjoy my fave vegan combo. It's a Mash Made in Vegan Heaven.